Many of Dada Mail's most advanced features rely on additional code libraries, called CPAN Perl Modules to be installed and available on the web server that Dada Mail runs on. These features are usually entirely optional, meaning Dada Mail will run just fine without them, but your experience will be greatly enhanced if they are available. Usually, if a feature is unavailable because of a missing CPAN Perl module: there will be an alert either in the included Dada Mail Installer where you would initially configure this feature; or from within the list control panel, where you would enable/work the feature. Dada Mail does already ship with many included CPAN Perl modules, but it can't ship with all of them, as they could potentially need additional configuration, a dependency outside of Dada Mail's or Perl's immediate ecosystem, or code compilation. 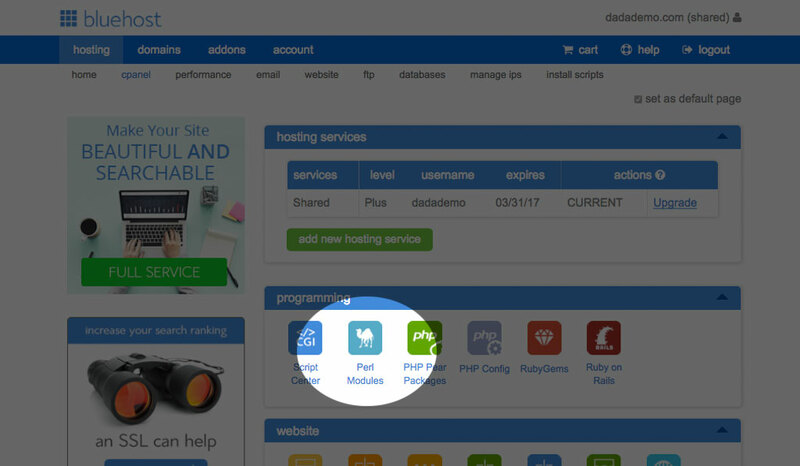 In this FAQ, we're going to focus on using the cPanel Perl Module Installer, which may be available to you, if you're running a hosting account powered by cPanel. We're going to go ahead and install Bundle::DadaMail which will give us all the optional modules that Dada Mail uses. The process of fetching the module and installing it will then commence. Prepare to wait a few minutes, as the process does take a little time. A lot of diagnostics will be printed out, much of which you may ignore, unless the install doesn't work correctly. One reason the installation of a module will fail is because a compiler is not available. If you're on a shared host, you may be out of luck, unless your hosting support can help. If you have more control over your account, like access to WHM, you can turn on complier support in there. Once the process is completed, click the button labeled, Go Back at the bottom of the screen (or generally: go back to the Perl Modules screen), and scroll below the, Install a Perl Module form, where the table of Installed Perl Module(s) is located. It should now be populated with many of the different Perl modules Dada Mail can now use. If you're not, you may have to ask your hosting support to install these modules. If you have full access to your webserver, the traditional ways of installing CPAN Perl modules will work just fine for you - either using a package manager released by the vendor of your operating system, or by using the cpan or cpanm command line tools. It's a little trickier, but certainly not impossible, to install Perl module without root privileges, but you'll need access to your account via the command line.